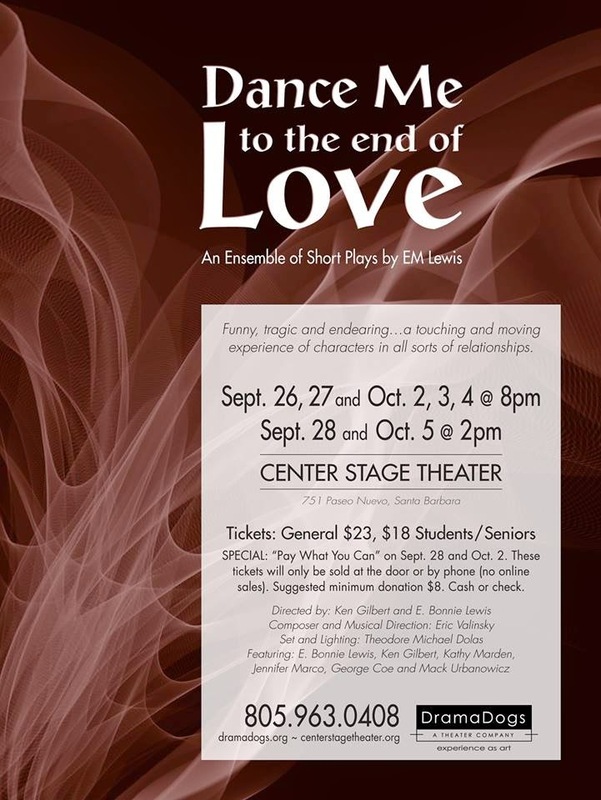 A wonderful theater troupe in Santa Barbara, California is producing an evening of my short plays, entitled Dance Me to the End of Love. I met Bonnie Lewis and Ken Gilbert a couple years ago, when we were all participating in the first annual PlayFest Santa Barbara. They were delightful theater-makers! So I was very pleased when Bonnie called me up and asked if her company, the DramaDogs, could read some of my short plays. They were looking to put an evening together. What they've ended up doing is far beyond what I could have imagined! 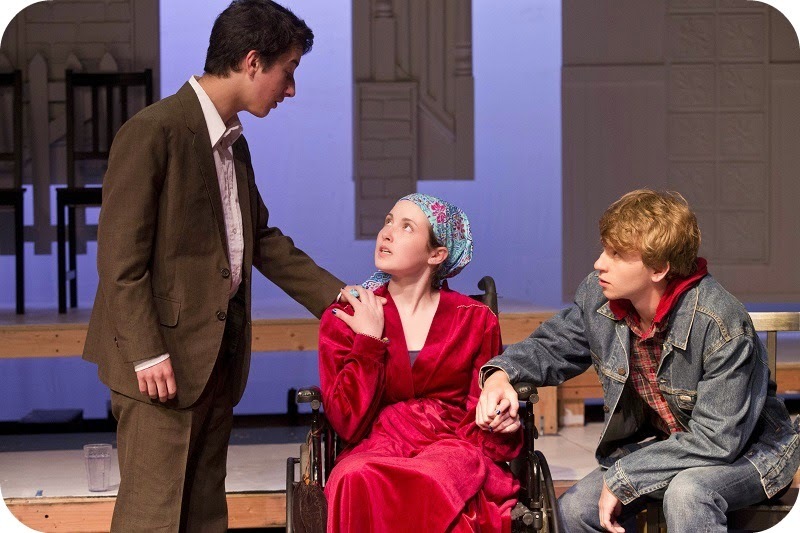 Not only did they select some of my very favorite short plays… they have woven them together with live music and tango dancing, taking advantage of their movement-based company's fabulous physicality. Several of the plays reference one of my favorite singer songwriters -- the inimitable Leonard Cohen -- so after a lot of thought, they ended up titling the evening after one of his songs. 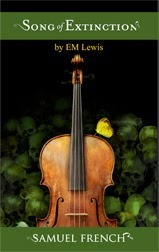 The show runs from September 26 through October 5. I hope you'll check it out if you're in the area! A nice review in the Santa Barbara Independent: Short & Sweet! An Amazing Summer of New Work! I've been too busy to breathe, much less blog, the last few months. And this summer is exploding with new work and fun in four different cities. Hope to see you at one of these upcoming events! I'll be back in Los Angeles for ten days, workshopping "The Gun Show" and having a reading of my epic Antarctica play "Magellanica" at Moving Arts. It will be so nice to be back in my old stomping grounds, and to be working with director Darin Anthony again. 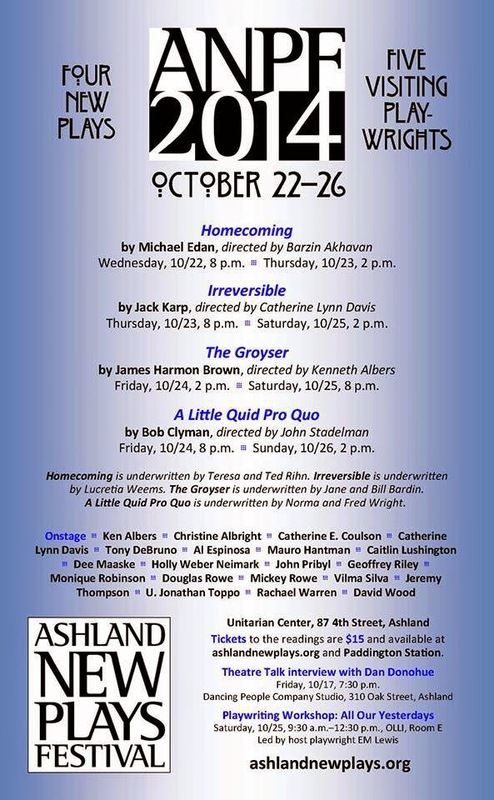 My most intimate and my most epic theatrical undertakings, both in the same week! 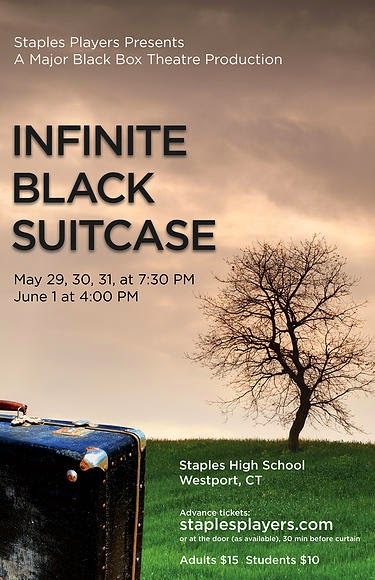 Staples High School in Westport, Connecticut is producing "Infinite Black Suitcase" at the end of May. I've had a wonderful time corresponding with the director, and wish the cast and crew all the best. Four operatic fantasies on temptation from the resident artists in American Lyric Theater's Composer Librettist Development Program: ENCHANTRESS by composer Kamala Sankaram and librettist Rob Handel; ARRANGEMENT by composer Elizabeth Lim and librettist Jerome A. Parker; THE DISINHERITED by composer Clarice Assad and librettist Niloufar Talebi and THE RESURRECTION ENGINE by composer Evan Meier and Librettist EM Lewis. Composer/librettist Mark Adamo will moderate the event. On June 22, Project Y will present a reading of my epic Antarctic adventure story "Magellanica," as part of their reading series of science and technology related plays. 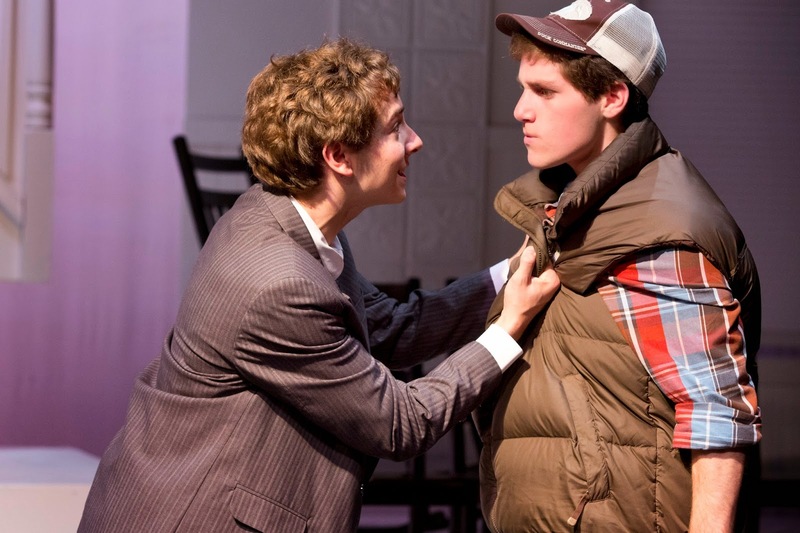 The centerpiece of the summer is the world premiere of "The Gun Show" at 16th Street Theater in Chicago. It's about guns and gun control -- written from the perspective of someone who grew up with guns in rural Oregon, but whose experiences with guns has changed through time and experience. 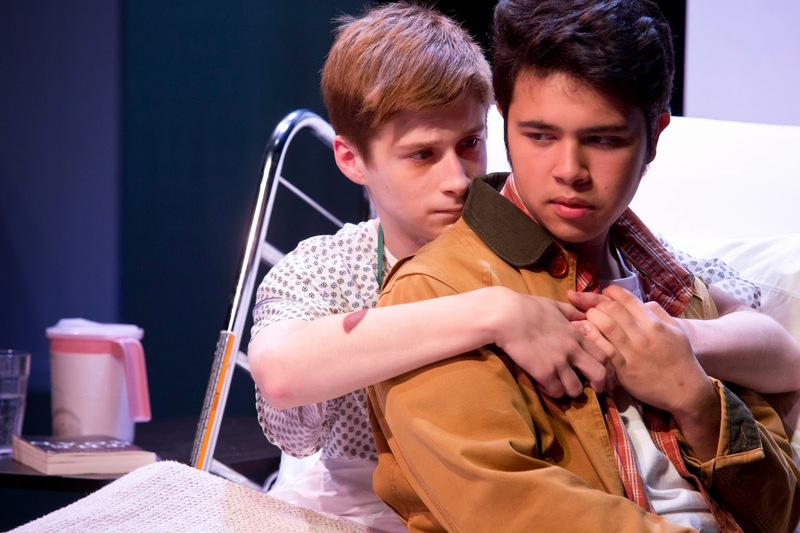 It will be directed by Kevin Christopher Fox and performed by Juan Francisco Villa. I will be there for the whole run.